Fed up with your blah, buhaghag hair? Give your locks new life with a fresh look. Is every day a bad hair day? If flat irons, curling irons, mousse, styling paste, leave-in conditioner, or other mane-taming tools and products just aren't cutting it, maybe it's time to take your problem to the pros. Pull off that ponytail and head to the salon for a reinvention to rival Madonna. Whether you're looking for a trim or a total makeover, the stylists of Vivere Salon are up for any challenge you throw their way. Their business is beauty, and the salon has a little over nine years of great hair care experience (and top notch Vidal Sassoon education) to its credit, so you can count on quality service. Vivere's interiors are as sleek and stylish as their cuts. Everything is decorated in modern, minimalist, monochrome shades. The white walls keep the salon looking clean, the slate gray floors give it a classy touch, and the glass and mirrors create more light and space. The black leather upholstery pulls everything together for an overall look that is effortlessly cool. They put a lot of stock into the styling environment, so to keep things fresh, all the attendants are dressed in black shirts, jeans, and sneakers. Rhythmic house music plays at a comfortable volume all through out the salon, and since your comfort is key, they'll offer you a cool drink of iced tea if you feel like it. If you're one of their regulars, you might even get the VIP treatment—they'll get you gorgeous in a private area. They don't just cut, they design. Many other salons that specialize in sleek, chic cuts can cost a lot, but Vivere's hair design services start at P330 for a cut from a top stylist and P450 for a cut from a creative stylist. If you like your locks but want to change your look by going for new color, Vivere offers L'Oreal Permanent Color (which starts at P1,600 for short hair). Cap highlights start at P1,700, foil highlights start at P1,900, or you can get strategic highlights with two to three colors that start at P3,500. If you're not in a particularly daring mood but want to make your hair color more vivid, try their tone-on-tone color service (also known as cellophane), which starts at P1,600. They also offer a wide variety of hair straightening and perming services for the ladies who are looking to add or reduce volume. Digital perms are by appointment and start at P6,000. Their latest services, L'Oreal Xtenso Moisturist Hair Rebonding and Xtenso Moisturist Volume Rebonding start at P7,000. If you've already cut and colored your locks and it's your hair's health that you're worried about, try their intensive hair care treatments. Vivere offers restorative treatments for chemically damaged hair, brittle hair, and sensitive scalps, and they also have preservative treatments that will keep your color and highlights looking great for longer. Going organic? Try their signature hair treatments, like their deep conditioning olive hair mask or their deep cleansing detoxifying hair spa with tea-tree and lemon extracts. If you want to have sleeker hair but don't want to go for that all-out, pin-straight rebond, try one of Vivere's latest services, Volume Rebonding with L'Oreal Xtenso Moisturist (starts at P7,000). Your poufy hair is straightened, but not completely (read: unnaturally) because your stylist expertly irons and curls your hair to give it a voluminized, blow-dried look that will last. 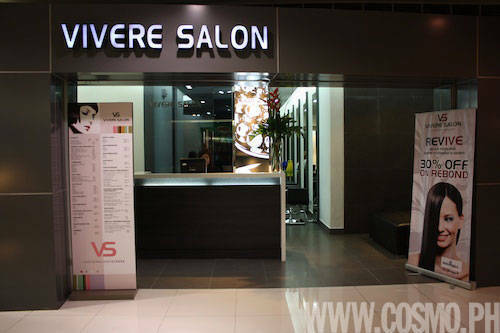 Whether it's to make your hair feel good or look good, check out Vivere Salon in SM Megamall, SM North Edsa - The Annex, Robinsons Galleria, Robinsons Place Manila - Midtown, and Marquee Mall in Angeles City, Pampanga. Click through to the Gallery below to see a few photos of the Megamall branch.